14 February 2014. The challenge that embracing shame poses to the longstanding perversion of honour, is the struggle for women’s human rights – the realisation of which will result in the entire community’s advancement and healing. 16.2.2014. A British reporter calls up clinics in Singapore asking if she can have her daughter mutilated there. Yes, she can, for 35$. Another reason why our struggle in Asia is so important: Parents may perceive the “service” in Singapore as clean and professional and not understand that this is ruining their daughters life just as well. SULÊMANÎ, Kurdistan region ‘Iraq’,— For many years, people have believed that practicing of female genital mutilation (FGM) is required by Islamic religion, and that is why the majority of people, especially in towns and villages in KRG provinces, adhere to the practice. This year’s statements on Febuary 6th, the Day of Zero Tolerance to FGM, differed positivly from previous years. Several organizations and state agencies acknowledged that female genital mutilation exists in Asia. USAID mentioned in their statement besides Indonesia, Malaysia, Iraq also the new evidence found in the Gulf States. (So we happily assume that they read our website!). Very encouraging is also that the German section of terre des femmes started a call to end FGM in Indonesia. It is also of great value that the regional offices for the Arab region for UNFPA and UN Women issued a joint statement. We are hopefull that we will achieve our goal with joint forces: To elminate FGM in the Middle East and Asia. On February 6th, the eleventh international Day of Zero Tolerance to Female Genital Mutilation, a number of media outlets have picked up on the topic of Female Genital Mutilation in Asia. Many non-governmental und international organizations tackling FGM, including the World Health Organization, still don’t mention the existence of FGM in many Asian countries. Breaking the silence is a first step to saving millions of girls in these countries from being mutilated. WADI and Hivos stressed this in their press declaration on this year’s February 6th. Therefore, we are happy that many journalists have now brought out this message. In several cases Stop FGM Middle East and WADI were able to provide information. 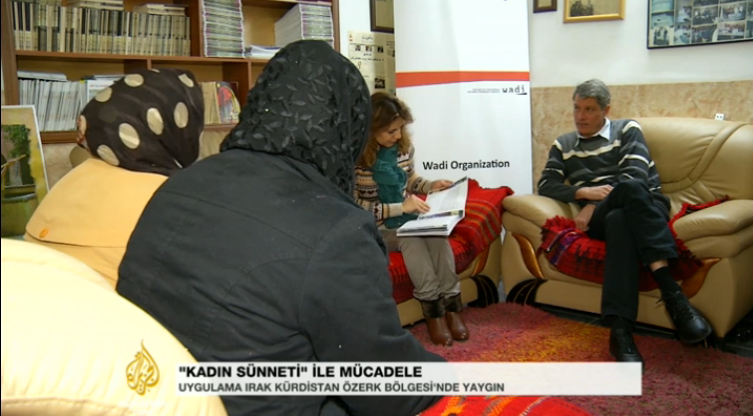 Al Jazeera Turkey came to Wadi’s office in Suleymania in North Iraq and spoke with victims of FGM. The film also describes the situation in Iraqi Kurdistan and the successful campaign against FGM. The painful memories are buried deep but not forgotten. Muna remembers the voice of her mother calling her. Muna was not going to the store for sweets. Her mother was taking her to be circumcised, as she herself had been at the same age. 4.2.2014. Sheikh Mohamad Alarefe recently tweeted his sentiments favoring mutilating women to close to 8 million of his followers on Twitter. By HIVOS and WADI; The Hague, Suleimania, 5 February, 2014. On the fourth official International Day of Zero Tolerance to Female genital mutilation (FGM), the practice is far from being eradicated. While the numbers of mutilated girls are decreasing in Africa after decades of concerted efforts, large regions where FGM is practiced are entirely neglected in this worldwide battle. This is particularly true for Asia. The practice is widespread in Indonesia and Malaysia, it exists in Iran, Iraq, and Jordan. In several countries of the Arabian peninsula FGM is practiced by relevant parts of the population.